Super Eagles dependable defender, Leon Balogun has successfully undergone surgery after suffering a fracture to his left hand on Friday. The Nigerian international star did not suit up for his clubside, FSV Mainz 05 in their 1-0 win over Cologne on Saturday afternoon. 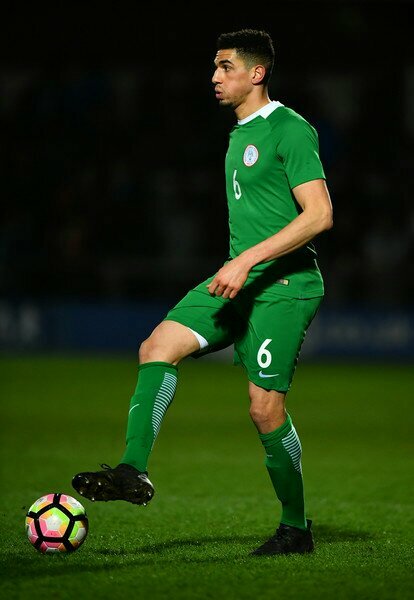 The German club confirmed the situation on their twitter handle: “Leon Balogun suffered a middle hand fracture on his left hand on Friday, which was treated surgically,” it said. The latest injury is coming after Balogun suffered a fractured cheekbone before Nigeria’s recent matches against Algeria and Argentina and had to wear a protective mask on his face. The central defender went the distance against the North Africans and was on the pitch for an hour against the two-time world champions. Speaking on the defender’s condition, the NFF official, who pleaded anonymity, said the federation was in touch with the player, who has assured that he is receiving adequate treatment from his club’s doctors. “We understand that he will be ready to play when we start our next round of tune-up games early next year, but we will keep monitoring him and other players. “Balogun has become a reliable defender in our team and the technical committee, as well as the federation, are constantly monitoring him and others to ensure that we have our best players available when we need them. Another Super Eagles stalwart who is also down with injury is Chelsea star, Victor Moses. The Chelsea wing-back Sunday hailed his English Premier League teammates over the 4-0 away victory at West Bromwich Albion last Saturday. The victory came from Eden Hazard (brace), Alvaro Morata and Marcos Alonso. You would recall that Victor Moses emerged winner of the 2017 Nigeria Sports Award Footballer of the Year. He is also shortlisted for the 2017 BBC and CAF African Footballer of the Year award.